Successfully Added Wireless FM Transmitter for IPOD + IPHONE to your Shopping Cart. Wireless FM Transmitter for iPod + iPhone car kit lets you enjoy your iPod or iPhone music on your radio while you drive. This wireless FM transmitter is a must-have gadget for iPhone and iPod lovers who want to enjoy their music on the road. This great little device plugs straight into your iPhone or iPod and broadcasts the audio to your vehicle's FM radio. You've already invested time and money into picking the iPhone or iPod perfect for you and loading it with gigabyte after gigabyte of your favorite music, and now you can enjoy your iDevice while you're driving. With the remote control, you can cycle through your songs easily and safely while you drive. Using this wireless FM transmitter is easy. Just plug the FM transmitter into your iPod or iPhone then tune the transmitter and your car's FM radio to the same frequency. You can now listen to all your favorite tunes straight from your car's speakers. 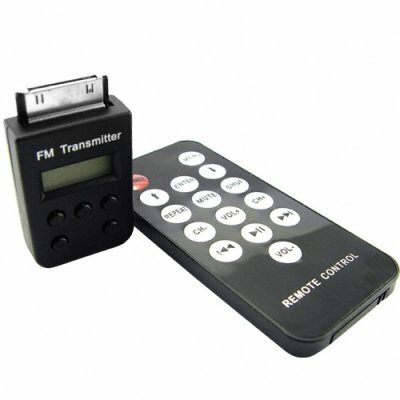 The FM transmitter is powered by your iPod or iPhone, or you can connect the included car cigarette adapter to power the FM transmitter from your car and charge your iPod or iPhone at the same time. Take advantage of this minimum order quantity opportunity to get a head-start on your gift shopping or to get the absolute best price for resale. Buying more lets you save more on both per item cost and shipping discounts. From your best source for factory direct electronics, Chinavasion. Can I use this wireless FM transmitter to charge my iPod or iPhone in the car? Yes. Just plug the FM transmitter into your iPod or iPhone, then plug the included car cigarette adapter into the FM transmitter.